The Spanish Formula one (F1) Grand prix is the fifth race in the 2016 Formula one (F1) season in Barcelona, Spain at the Circuit de Barcelona –Catalunya on the 15th May 2016.
the Spanish Grand Prix is a Formula One race currently held at the Circuit de Barcelona-Catalunya in Barcelona. The race is one of the oldest in the world still contested, celebrating its centenary in 2013. The race had modest beginnings as a production car race. Interrupted by the First World War, the race waited a decade for its second running before becoming a staple of the European calendar. It was promoted to the European Championship in 1935 before the Spanish Civil War brought an end to racing. The race was successfully revived in 1967 and has been a regular part of the Formula One World Championship since 1968 at a variety of venues. Work on the Circuit de Barcelona-Catalunya was underway in Barcelona thanks to the support of the Spanish government, and in 1991, the event moved to this new track, where it has remained since. The 1992 event was advertised as the Grand Prix of the Olympic Games. Since that race the race has been held in early season, usually in late April or early May. The Williams team dominated the first outings there, taking all victories until 1994. Michael Schumacher has won a total of six times, including his 1996 victory in heavy rain, which was his first for Ferrari. Mika Häkkinen took three victories and was on road for fourth in 2001 before his car failed on the last lap. 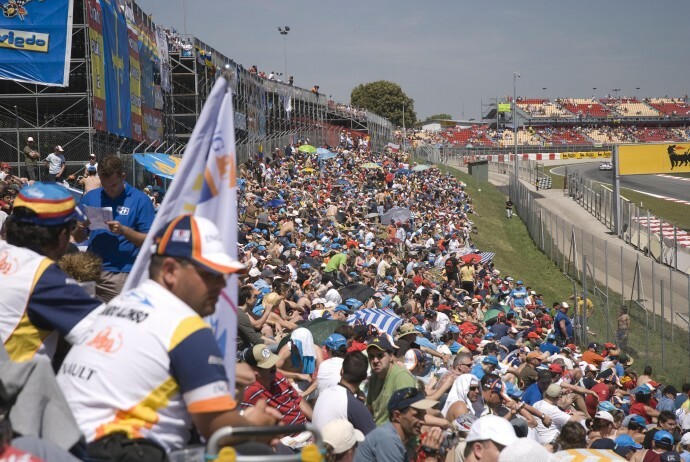 Since 2003 the race has been well attended thanks to success of Fernando Alonso. Alonso finished second in 2003 and 2005 before taking victory from pole in 2006. Alonso also finished third in 2007, with two further second places in 2010 and 2012, where he finished behind the Williams of Spanish speaking Pastor Maldonado, who won from pole; this was the first win and pole in a Grand Prix for a Venezuelan driver and Williams’ first win since the 2004 Brazilian Grand Prix and the team’s first Spanish Grand Prix win and pole since 1997. Two Spanish drivers have won the Spanish Grand Prix; Carlos de Salamanca in 1923 and Alonso in 2006 and 2013, with Spanish speaking Juan Manuel Fangio winning in 1951 as well as Maldonado in 2012. From 2013, the Spanish Grand Prix was supposed to alternate every year between Catalunya and the Valencia Street Circuit. However, this did not happen—Valencia dropped out for financial reasons and Catalunya remained the sole host of the Spanish Grand Prix. Barcelona El-Prat International airport in Barcelona (LEBL / BCN) lies 40 kilometres away from the Circuit de Barcelona and takes around 35 minutes journey time by car, subject to traffic. Arranging a private jet charter or helicopter transfer with Freedom Air to arrive in style to the Spanish formula one (F1) grand prix in Barcelona is simple. The Freedom Air team can be reached on +44 (0) 1275 548001 and charters@flyfreedomair.com to book your next trip.